Posted 12:34 by Rich Davies & filed under Everything else. Well, it’s been more than a year since our last post. Sorry guys, we’ve been busy with ebug.co.za our homebug-like offering for estates and businesses. Hope you like it! Once again we’re bringing you some AMAZING news. If you are connected through your municipality (sorry, if you pay Eskom it’s already too late, you had your rise in March) you still have less than 30 days left to TOP up your meter at last year’s rates – saving you possibly as much as 13%. Just like last year, you have to be clever about it – otherwise you might end up spending more. The rule is exactly the same as last year you should buy units until you’re at the TOP of the BLOCK that you normally use. The blocks are determined by your municipality and possibly which ‘tariff’ you are on within your municipality. Once again we want to answer the question – should I fill my tank before the price rise! YES YES YES! But it’s not as simple as filling your petrol tank before the monthly price change (which also you SHOULD do before Wednesday to save 52c/litre (according to Business Tech – or around R26 for a pretty average 50L tank). For your electricity it’s pretty much the same thing, but just imagine the Petrol pump charged you MORE if you bought over 100 litres in a month…oh and your tank is unlimited in size and doesn’t cost you anything to carry around! 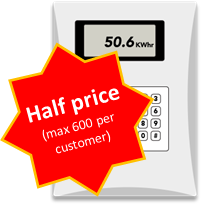 That’s what it’s like with prepaid meters, you can buy extra now, at the old rate, and then use them up after the price has risen – saving you money! We’ve updated our handy spreadsheet tool for City of Cape Town. City Power (Jo’burg) — I’ll try to add some others later today – but if your’s is missing, please ask in the comments and (if you can) send us where the tariff is online and we’ll update it for you. A quick run through – for City of Cape Town – say you normally spend R500 per month, then in 2015 that bought you 284 units each month. If you buy R1055 this month, you’ll get 600 units – all at the same price (R1.76). After 1st July you’ll be paying R1.88 per unit – so any extra units you buy you’ll be saving 0.12c each unit — okay, it’s only R37… but it’s something! On the other hand if you currently spend more than R1060 every month, then you should buy AS MUCH AS YOU CAN. Every extra unit you buy, you’ll save 0.15c. So buy 1000 extra units and you’ll save R150. You just need to make sure that you carry on buying your allowance of 600 ‘cheaper’ units every month after – those 600 units cost R1125 after the price change. So this month buy as much as you can, then KEEP BUYING R1125 every month after that until you start to run out. Make sense? City of Joburg is ALOT more complicated – it has 4 different blocks of prices – so it can get VERY confusing. The same rule applies however – you should buy up to the top of the block that you ‘normally’ buy in. These blocks are at 500, 1000, 2000 and 3000 units every month — or looked at the other way around – spending R603, R1370, R2941 and R2984. With the new tariffs these will change to R647, R1471, R3159 and R5353. So put simply if you spend R400 on average per month, you (in total) spend R600 this month and then R0 after until you run out. If you spend say R800 normally, then spend R1370 this month and then after the price make sure you spend at least R647 every month until your credits run low. Before the price rise each month buy 603 1370 2941 4984 more.. If you’re having problems please leave us a comment! Here’s the link to the spreadsheet tool – Enjoy! ** We have to say the same warning as last time – if you get FREE BASIC units – then this probably isn’t a great idea! If you buy too much one month you might end up losing your allowance of free units, which will cost you MUCH more in the long run. For those you get free units, we’d always recommend only buying what you need every month – and make sure you ALWAYS collect your free units every month, even if you’re away – so just make sure you go to the shops and buy a basic level R10-100… every single month. Every year about 1 in 10 people who are entitled to free units doesn’t collect them, don’t be one of those people! Whether you are entitled to free units depends on your municipality – generally you have to be qualified as ‘indigent’ and must use under a certain amount every month or year… ask someone at your municipality if you think you aren’t getting what you deserve. Posted 11:54 by Rich Davies & filed under Everything else. Tomorrow, April 1st, Eskom will be rising it’s prices for all direct customers. You’ve got just today left to ‘top up your tank’ before the price rises by 12.7%. But you need to be smart about it. If you just go out and fill-up, you could be paying 70% than you need to. Posted 14:14 by Rich Davies & filed under Trim the tariff. Eskom have indeed officially asked for a 25% increase in tariffs starting in April/July this year. This means that prices for a typical houseshold consuming around 1000kwh each month can expect bills over R2000 each month by 2017.